Pelicans on pond near Mission. Unpaired pelicans "hanging out" and foraging in Mission Valley. 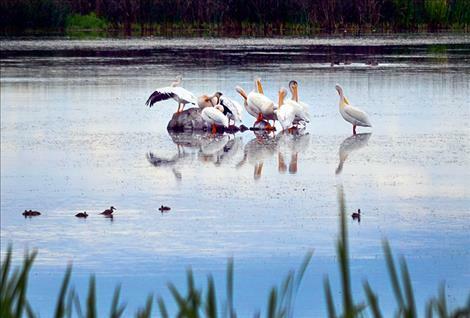 Nearly 100 American White pelicans stopped along their migration route July 13 in a pond west of Highway 93, across from the Mission Mountain scenic lookout. The pelicans return from as far away as California, Mexico and Central America to nest in southern Montana waters on the far side of the Continental Divide during late spring. Dale Becker, Tribal Wildlife Manager for the Confederated Salish and Kootenai Tribes, believes the pelicans are unpaired, sub-adults that are just hanging out and foraging. “There’s no indication that they nest here, but they do nest in several locations east of the mountains,” Becker said. The pond is located in a waterfowl production area owned and managed by the U.S. Fish and Wildlife Service. 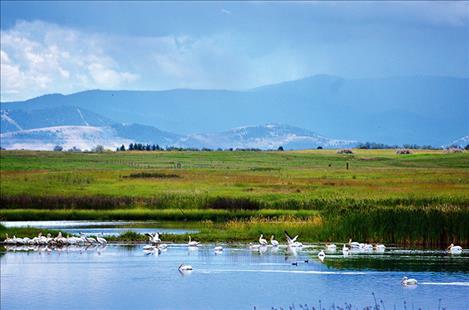 Pelican sightings are rare west of the Divide, but the Ninepipe wetland area has one of the highest density of reported pelican observations, according to the online Montana Field Guide maps. Although there’s no sign of pelicans nesting on the pond, trumpeter swans have nested there for the past decade, encouraged by the tribes’ swan restoration project — although no young were produced this year when swans nested in a low point on the southeast side of the island. The unusual nesting site was vulnerable to coyotes, Becker said, yet wildlife biologists didn’t see evidence that predators disturbed the nest. The pelicans may hang out through August, according to Becker. They are often seen soaring high in the sky.